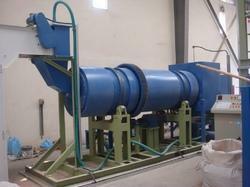 Rotary Vacuum Dryer offer clean, simple and effective method of drying wet cake, powder, and even slurry. 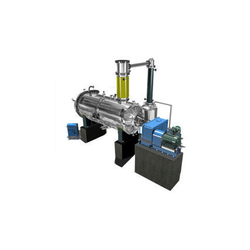 We are engaged in supplying superior quality of Rotary Vacuum Dryer that are designed as per the specification of the clients. Material: M.S. Grades / S.S, Grades Haste alloy / Titanium etc. - PC-07 controller with LCD display displaying at a glance gradient hold time & temperature with service free controller. Rotary cascade dryers have the feed materials pass through a rotating cylinder together with a stream of hot gas. Internal lifters or flights elevate the feed and drop it in a curtain from the top to the bottom cascading along the length of the dryer. Flights need to be carefully designed to prevent asymmetry of the curtain. temperature with service free controller. kilburn has developed world-class expertise for design and manufacture of rotary dryers for carbon black. Several plants of large size have been delivered to many world leaders in carbon black. These dryers have proved their superiority and acquired international acceptance for quality and operational performance. In order to conquer enormous level of patron belief, we have been engrossed in offering a vast collection of Rotary Dryer Machine. With the support of cutting edge creating techniques and indigenous developments, we have been able to come up with this high-tech SS Rotary Dryer.